A Wido Satan -- the vintage Lil' Satan design with a Cox Black Widow, much more powerful than the Baby Bee engines that powered most Lil' Satans back in the day. All photos provided by Ken Burdick. Shhhhhhh ... Be vewy, vewy quiet. We're hunting wabbits. Even the most innocent of ideas can, given the chance, snowball into a thing that begins to gather momentum, roll backwards and squish the originator. Such was the case when I received an e-mail from master modeler and longtime combat flier Gene Pape. It was some nonsense about rebuilding a Cox Black Widow .049. My first thought was why bother? but after reading further, I began to take interest. As any good Bod Buster, or Beaver can tell you, such statements must not go unfettered. If you don't know Gene, he's nothing if not detailed. He concluded that the engine had a cracked piston, which at the time of this writing has yet to be proven, but it did jog my memory. Hey, I think I have one of those things in a drawer someplace. The next day, I replied that I did indeed have one, in parts, and it was glued solid from castor oil. I have lost the email thread, but we began to talk about the Black Widow engine. It got intermixed into a BBB e-mail and then to Kelly Crozier, engine collector/combat flier and winner of the first Combat Graffiti, who then passed along Paul Giebault's article on how to rebuild the Black Widow. Somewhere in the e-mails, the airplane, Lil' Satan, came up and the remark was made that they flew great but not with the BW because of the added nose weight. Zoot Zoomer (Mike Hazel, speed guru) was then copied and said that he had a kit that he would send to Gene. But later, Gene found a full size set of plans and began yet another layer of complexity. I said, We should create a new event and drive John crazy. John is the long-suffering editor of Flying Lines and coordinates the Northwest competition events; he also knows there are too many combat events already and wouldn't give a Lil' Satan with a Black Widow on it the time of day. As soon as driving John crazy was mentioned, Mike said I'm in -- GAME ON!" So Gene got busy making up a plan set and kits of the ... Wido Satan (pronounced as per Elmer Fudd). So while Kenny-b was busy rebuilding the Black Widow he found in a drawer, Mike was digging out from under 20 inches of snow and Gene was building kits! Hey ... It's rolling backwards! Did you notice the use of the word "we" in the above statement? By now, the idea to drive John nuts was becoming more than just a daydream and Gene was actually making kits for people to build! Lemme see now... One for John's birthday in March, two for Gene, a set of plans for me and a couple for Mikie. 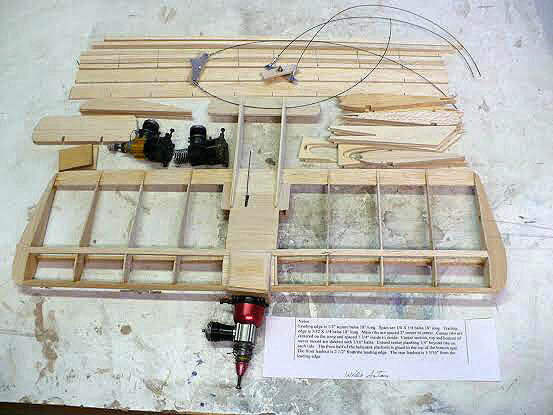 There will more as the idea of turning our childhood favorite airplane into something useful takes shape. To date there are seven in the works. The .049 that I had in a drawer for 15 years, was no trophy. I took the parts and cleaned them. The backplate broke immediately. There were no gaskets of any kind and I only had some funny looking heads and plugs. Barrie Hobkirk had given me a reed valve about a year ago ... but it had gone missing. There was nothing to do but send to Cox International for the various parts, gaskets and o-rings. About $40 later, I was satisfied I could fix anything the old cow could throw at me. However, I didn't anticipate the delivery time from Canada to Seattle. For most things, I have them delivered to Seattle and pick them up on my next visit, but, it had been three weeks and counting. In keeping with the project so far, I didn't notice until after they sent the merchandise that Cox International is located in British Columbia, which would be a few days from my house there. Meanwhile, Gene, who lives in Eugene, Ore., had ordered parts from Cox and received the merchandise in a week. I on the other hand had not received it in four. 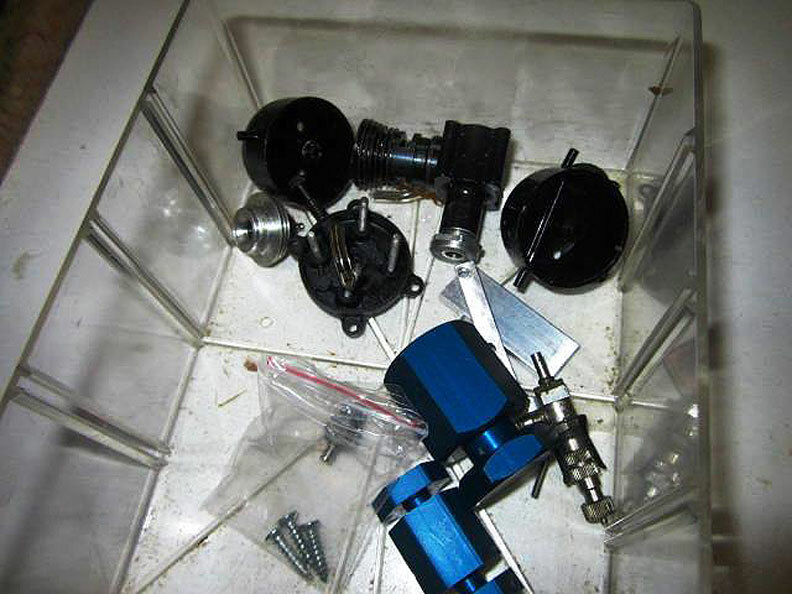 Cox refunded the money and good buddy Barrie Hobkirk supplied the various parts for me. We later learned that there was an address mixup through Pay Pal and the material was returned to Cox. Bernie called me right away letting me know the parts finally came back to Cox. They were the best to work with. Lacquer thinner is normally not used as a disassembly tool, but my old Black Widow engine was more than stuck. After much soaking, The various parts fell into pieces. One of the plastic backplate screw holes broke out, likely from a kid crashing the thing. A bit of JB Weld fixed it, and might have worked except I redrilled the hole off center. The piston was tight and needed polishing. I used a Post-It note wrapped around a fitted dowel to polish the liner with and also used it to polish the piston. There is enough abrasive property to it to get what I needed. The piston now falls freely to the top of the stroke when dropped into the bottom of the cylinder. This is by no means a lapping method, but plain paper will polish slightly. The fuel tank has a tube running through it. This tube is the air intake, and as per Paul's article, it was enlarged to .082 and cleaned. Here is a link to Paul Gibeault's very well thought out article on how to set up the Black Widow for racing. It's vewy, vewy good weading. For fun, I thought I would assemble the engine and just run it to see what happens. It ran but would not hold a rich setting throughout the tank. The problem was that air was leaking into the tank and metering tube (needle valve leakage) changing the setting from rich to lean. I put it underwater with the venturi hole plugged, and pressurized the tank with a syringe -- it leaked from everywhere! Needle valve, tank screws, tank to back plate seal. Another couple of hours fiddling and it's mostly good now. Paul's article gives you complete detail on how to correct the problems I found. 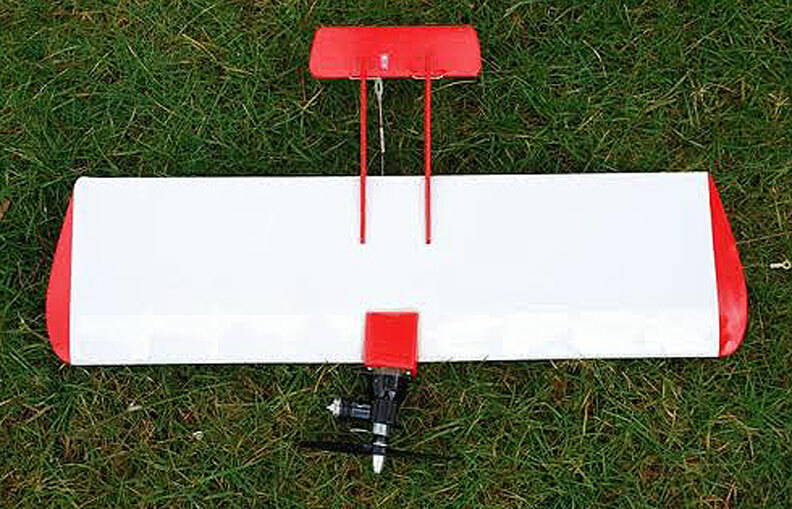 Well, the Wido Satan is no sonic chicken, but it does fly well as long as the CG is 1 inch back from the leading edge. Tank capacity is a problem because they just don't run for too long. Because of this, the best minds of our times have conspired to write the event rules for WIDO-SATAN COMBAT! Lines: .012 braided steel lines (or equivalent) 35 feet plus or minus 3 inches. Streamers: Streamer length is 60 inches, width is 1/2 inch. The string leader shall be 4- to 8-pound-test cotton, shall be marked with ink 48 and 72 inches from the knot, and shall extend beyond the ink mark 12 inches. Experts flying against newbies must tie their streamers at the 72" mark. If both pilots are experts, both use the 48-inch mark. If both are newbies, both use the 72-inch mark. After a starting period, both planes launch simultaneously and combat starts immediately. If you can't go at the signal, you lose. If you come down for any reason before the length of the match, you lose. In the case of a mid-air collision or line tangle that brings down both planes, you both lose. One point will be awarded per cut, a kill wins the match if the competitor scoring the kill is able to complete the flight period. No airtime points. "Experts" fly with longer streamers when flying newbies. In the event of a tie score, a coin toss will decide the outcome. 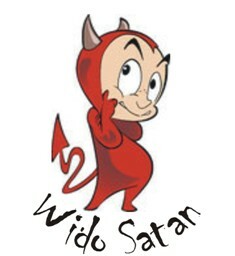 The attached PDF docment will print out full size parts for the wido Satan. The instructions are such that you can build one without a plan sheet. 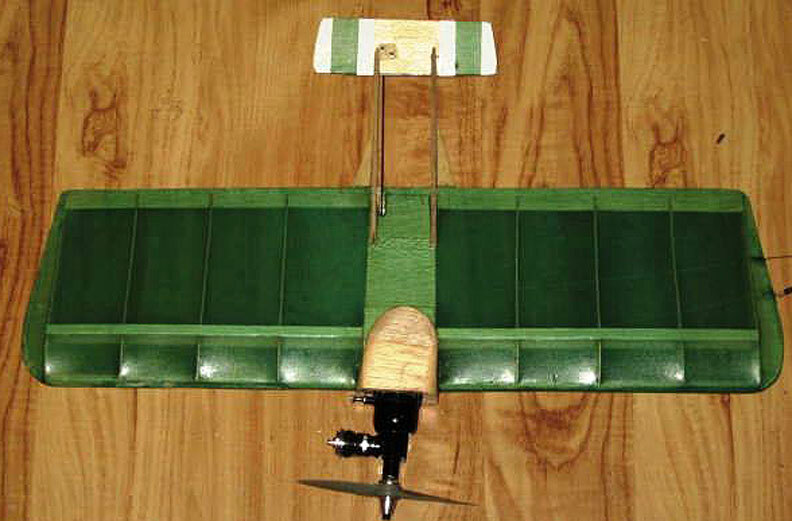 The notes for plywood booms is to add tail weight to the model. It will balance about right if your engine has a plastic backplate. Dave Shrum's Wido Satan under construction.